The Star brings hope, renewed power, and strength to carry on with life. It shows how abundantly blessed you are by the universe as evidenced by the various things around you. It may not be directly evident at the moment, for this card follows the trauma of the Tower card. Remember that you hold within you all that you need for your fulfillment - the only thing that you need is courage. For this, you have all reasons to rejoice. To see this card is a message to have faith, for the universe will bless you and bring forth all that you need. To see this card is a message to have faith, for the universe will bless you and bring forth all that you need. To receive the Star in your reading means that you have gone and passed through a terrible life challenge. You have managed to go through this without losing your hope. While you suffered, you perhaps were not aware of your own strength, but you are now perhaps recognizing that the loss helped you discover your own resilience and inner power. It is only now that you can really appreciate all that you have. 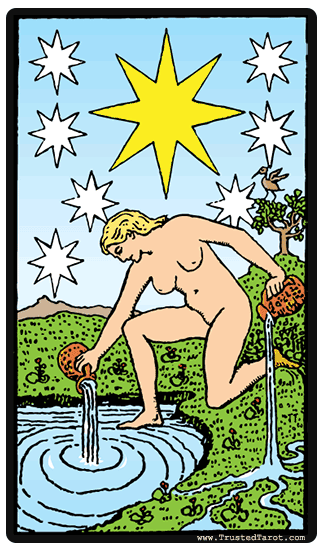 When the Star card is reversed, it means that you are feeling as though everything has turned against you. The challenges that you would normally see as exciting seem instead to make you feel as though you cannot overcome them. You have lost faith in something, whether inside yourself or with something you normally find dear. Without hope, without faith, we cannot find the motivation to progress forward in the challenges that we face. Where in your life are you feeling hopeless? In what ways do you already feel defeated? And how does that affect your actions? The star reversed asks us to nurture our sense of hope and positive energy to help propel our actions with joy instead of fear.